Net Galley recently provided Catch of the Day by Jimmy Houston for review. Since my husband is an avid fisherman, I asked him to write the review for me. I have always enjoyed watching Jimmy Houston Outdoors. Ever since I was a teenager, I would search for his program, so I could learn fishing tips and become a better fisherman. When my wife came across his devotional gift book Catch of the Day, it drew my interest immediately. Now not only can I get great fishing tips, but I can also get helpful spiritual tips for my daily living as well. 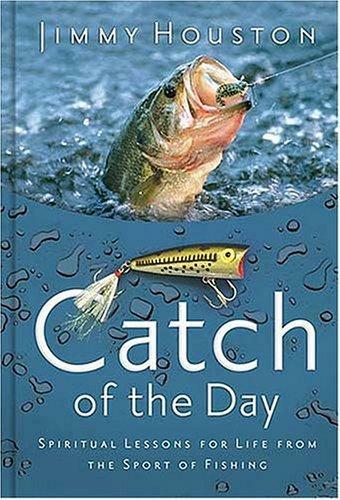 Anyone who loves Gods word and catching fish will really find this book a source of help. It was a good surprise to know that Jimmy Houston is a dedicated Christian. Many religious books today only focus on feel good issues. It is very obvious to me that though he really enjoys fishing, his first priority is his service to God. The world needs people with Godly convictions to challenge their lives. I can see how this book could minister even to unbelievers. Because of the way he illustrates facts, knowledge, and experiences through fishing, he is able to show people's need to believe and apply the word of God to their lives. This book would be a terrific addition to anyone who is looking for an inspiring devotional and who enjoys fishing and the outdoors.